Any action for change within a healthcare system starts with a realization that something is happening which should not be taking place. Sometimes the problem and its solution are crystal clear, but often there are so many attributes to a problem that it becomes difficult to know where to start. 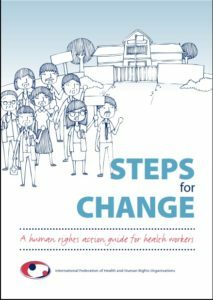 This section describes how to use a human rights approach to pick apart the problem in order to identify entry points for action. By looking at the issue from a human rights perspective the problem is brought back to the ones that are directly affected, why it is happening and which actors are involved. Before walking through these five steps, it is necessary to first select a problem within the healthcare system that needs to be addressed. A case study is included which shows how each step should be applied. Templates which can be used to complete the steps are available here.